Only ever heard good things about this one, so it had to be added to the collection. Not very good timing though as Vince has just bought one! :o) I have done the main fuzz and buffer circuit separately so those who just want to build the fuzz can do so. If you do want to include the buffer put it in a true bypass loop with a toggle before the fuzz circuit so you can bypass the buffer if you want to. And here is the buffer for people who want to build the whole thing. Nice, gonna build this tommorow. Are the trimmers also there on the original? Also, what kind of trimmers do you use yourself? The only trimmers I have that fit in your layout are Piher 6mm's. The first ones in particular are good for smaller spaces like with this layout, but they both have the required 5mm pitch distances. Alps RH06's are really great too. They too have 5mm pitch distances, but the outer legs are about an inch long so you can use them for any span. Very useful for resistor replacements to bias without having to do a special layout to accomodate trimmers. Oh and yes the trimmers are in the original. Haha! I would swear profusely here! ... I'll still make one though mate as it's a pretty small build and I can a/b it with mine and if it stacks up well, I'll just sell on the original. I'd definitely recommend one though..fantastic fuzz...both knobs cranked and it's bliss..
Use the lowest value you've got. It's one of the anti oscillation measures we were talking about the other day and I've done it with 47R or 100R (can't remember which) in the past. Will BC108b work for this? Yes they're just in a lower gain range. Socket and experiment to get your favourite pair. To be honest I just don't know. Like in a normal chain the Fuzz Face may not react well to a buffer in front of it, so it's a case of try it and see. That's why I haven't just included a buffer of my choice in the layout, because it just may not work properly. When Vince has received his we may coerce a few high res gut shots out of him and hopefully be able to come up with the buffer from that. That won't be a problem...When it arrives, I'll snap some pics. I've not forgotten the pics mate, I've had to send off for a new battery for my camera...I'll get them done ASAP. What A great sounding Fuzz. Really gets that Gilmour "Time" Solo tone. Does anybody get that strange behavior that the fuzz sounds kinda weak throughout the clock on the fuzz knob and then when you reach the max the fuzz really gets sharp and penetrates your guts? Did you build it from this or have you got an original? If you're talking about the original then yes, the fuzz control does act that way... I keep it cranked and use the guitar volume. Thats the geat thing about this one, cleans up brilliantly. Thats where the buffer is useful, It gives the fuzz a bright kick on lower settings. Well I built a similar one which does not include trim pots but a 33k for TP1, 100k for TP2 and a pot for TP3 for biasing Q2. I used BC108C and I did NOT use the buffer section. The output pot was also lower. I did use a 50k pot for the input to get lower input but that's not a buffer. What parts are the buffer? the 6n8 cap and the 47k res? What is the function of this 47k? The 47K is in series with TP2 and sets a minimum value. So with that trimmer you can alter the value from 47K to 147K, for what is usually a 100K resistor and so it offers a nice range of tweaking. The only thing I'm dubious about is that the feedback resistor in the classic Fuzz Face is at the transistor side of the 2u2 cap, and so would come from the base of Q1 rather than directly from the input wire row. That is definitely how it is shown on the schematic, but whether it's an error I'm not sure because the guy who did the scheme never answered the question when asked. If it doesn't work though that's the first thing I'd look at, 47K and 47p coming from Q1 base rather than the connections shown. Any chance of posting the schematic of this one? The more I look at it the more differences I find from the good ol' Silicon Fuzz Face like the Axis Face by Bryant or the GGG Silicon Fuzz Face. Maybe it's closer to the SunFace? 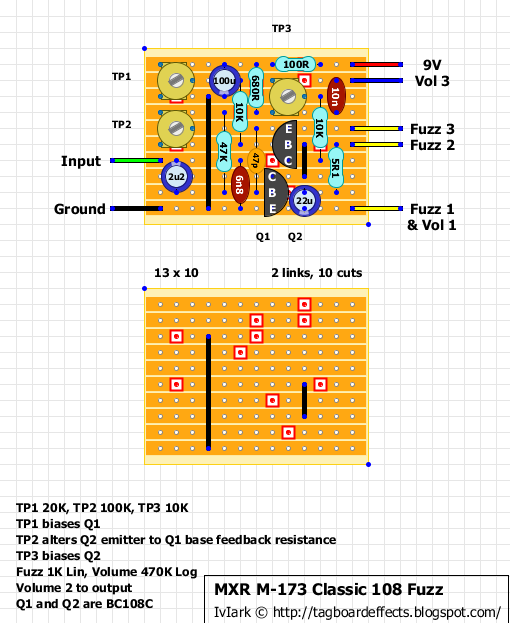 OK....got the schematic from the Freestompboxes forum. Except for a few value changes, the main difference from a regular Fuzz Face is the way the feedback resistor between Q1 and Q2 is placed. As you said Mark, On the MXR it's before the input cap where as in the original designs it's after the input cap. Definitely makes me wonder and probably behaves somewhat differently. I've had no joy with this mate. I used a 10r in place of the 5r1 and used BC108C's (tried many). Funny thing is, is it that something is working. If i press the back of the board I get a fuzz signal now and then.. I've also tweaked all trimpots in all positions. I've reflowed all joints etc so I really don't know. could be my build. Hopefully someone will have better luck with it. Before you ditch it, I'm still unsure about the connection shown for the feedback resistor(s) in the schematic. Remove the 47K and 47p and solder their bottom leads into the second from bottom row between the 6n8 and link. See if you can cram both into the same hole with their top leads going to the same places (Q2 emitter for the 47p and top lug of TP2 for the 47K). That is how a conventional Fuzz Face would connect so it would be interesting to see what happens. I also have problems with my build, made the board a couples of rows longer though to fit some larger trimpots there so that could also be the problem. I have checked everything though and have the same problems when pressing on the 2u2 there is some kind of fuzz sound! I just noticed that the trimmer graphic could be interpreted as being in virtually any orientation (I'll have to alter that). You have both got the wipers for all the trimmers to the right haven't you? Yes, all trimmers are pointing to the right. Here's a pic, I replaced the 10k resistor coming from TP3 with a jumper because I couldn't get a voltage above 2v at the collector of Q2. Didn't work though, voltages are still low. What high and low voltages are you getting at the top of the two 10K resistors when you rotate each associated trimmer? What voltage are you getting at both sides of the 100R? Something has to be wrong with the trimmers then. In the fully counterclockwise rotation of TP1, it effectively attaches the top of the 10K directly to the supply rail and so you should be getting close to 9.27V. In the clockwise rotation it puts 20K of resistance in the way and so you would expect less. Same issue with TP3 but at slightly lower voltages because of the 680R resistor. The higher voltage will be in the clockwise position for TP3 though. So TP1 fully CCW and TP3 fully clockwise should be giving you close to thefull supply voltage at the top of the respectiev 10K resistors. After some fiddling with my trimmers TP1 fully CCW has 9.23v at the top of the 10k while TP3 fully CW has 8.47v at the top of the other 10k. This is correct right? TP3 fully CCW has a voltage of 4.73. So at the top of the 10k the voltages ranges between 4.37 and 8.47 while the bottom end of this 10k resistor only has a voltage range between 0.77 and 1.12. Looks like there is some problem in this row. I only get sound when shorting the 2u2 cap! Your voltages in your previous post look good, the 0.77 to 1.12 at the other end of the 10K looks too much of a drop to me. Have you tried any other transistors, just in case that is pulling it down? Nope, exactly the same with different transistors! Ravian: Desolder the bottom lead of 47K resistor and wire it to the Q1 base instead of the input. This makes a nice blue-face alternative. I used B500K pot for the volume and subbed the 5R1 with 7R5. If i was to rebuild this, i would go with C1K for fuzz pot. For transistors, i went with BC108B for Q1 and BC108C for Q2. I always shout out that "Do not take bias control outside the box!" - but this time that could be something to think about. Seems that you can't break it with those three trimmers :) Might have something to do with them being relatively high gain silicons.. Anyway. Once fixed, it's a nice fuzz. hi i want some information about trimmers biasing q1,q2 and feedback what are the voltages i must have? Fuzz Faces are tricky beasts, but I can say I got this one working. It's still a bit gated (I didn't match the transistors), but it's not bad at all. It remains articulate on chords, which I like, and sort of gets the Eric Johnson violin tone up the neck. However, I still prefer the Meathead. Transistors were my favorite mid-gainers (BC550B). I forgot to mention the mods: I call it the "I'm way too lazy to get trimpots" mod. The 10K bias resistor gets upped to 22K, and the top lead gets moved up a row to +9V. The only trimpot I used in the build was the 10K to bias Q2, and that's really important. Hi thanks for your amazing work! Does your vero permits to build the buffered version of this fuzz? You could take any buffer from the library and use the dual effect outboard wiring guide. Just take the buffer stompswitch and replace it with a toggle. You could also omit the LED from that switch. Is there any information on how to properly bias? Or is is best to do it by ear? Tune it by ear. With Si BJTs (bipolar junction transistors) i've found that to be the best course of action. They will work with almost any setting, but affect the texture of the fuzz - While JFETs and Ge BJTs usually need just the right bias voltage to work properly. Hi! 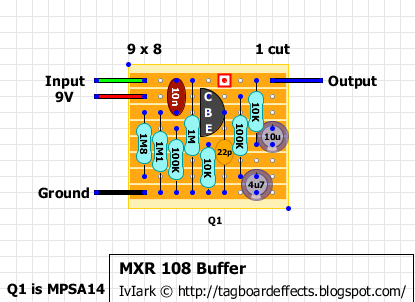 Is there a transistor I could use in the buffer instead of the MPSA14? Tayda does not have them and I can't seem to find any in my area. Any ideas?